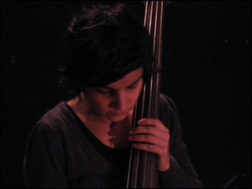 Margarida Garcia is a double bass player who entered the world of creative music in Portugal quite late (in 1998) but already left a distinctive mark in small communitiy. Not only with her regular work with guitarist Manuel Mota, trumpet player Sei Miguel and both members of great electro-acoustic duo Cremaster (Ferran Fages & Alfredo Costa Monteiro), but also as a concert organizer and founder of Thin Ice label. She pushes basic sound language of her instrument out of the soundfield that reflects the past/ the history/ the expected into the brave new world of sound and art that is criticall to the present and raises questions for the future. Currently she plays in a regular group Curia w David Maranha, Manuel Mota, and Afonso Simões and has a duo w Marcia Bassett from Double Leopards. Her collaborations include among others: Barry Weisblat, Toshio Kajiwara, Phill Niblock, Fred Lonberg-Holm, Ruth Barberan, Michael Rodgers, Will Guthrie, Takehiro Nishide, Rhodri Davies, Mark Wastell, Marina Rosenfeld, John Tilbury, Phill Nibllock, Anthony Guerra, Otomo Yoshihide, Loren Connors, Tim Barnes, Mattin and Eddie Prevost. She also works in different fields of art- contemporary dance, video art and sound installation.